This is a global variant set in the mid-19th Century. ﻿This is a global variant set in the mid-19th Century. It was designed to provide on-line players with a (hopefully) fun and challenging global game in a historical setting. However, this variant was not designed to recreate historical events. It merely uses them as a springboard. If a Power occupies an opposing power's Home Supply Center, he may build from it as if it were his own. Example: USA occupies Richmond. Until another power occupies Richmond, it is considered a Home Supply Center for the USA. These zones act exactly like Switzerland in Standard Diplomacy. Large Island Chains are essentially two coastal provinces surrounded by water and attached by a land bridge. Both Armies and Fleets may move from Island to Island. However, a Fleet may not move from one Sea Zone to another on the opposite side of the Large Island Chain. The player that owns Constantinople (and only that player) may move (or retreat) a fleet directly from the Black Sea to the Aegean Sea, or vice-versa. These land bridges work exactly as they do in Colonial Diplomacy. 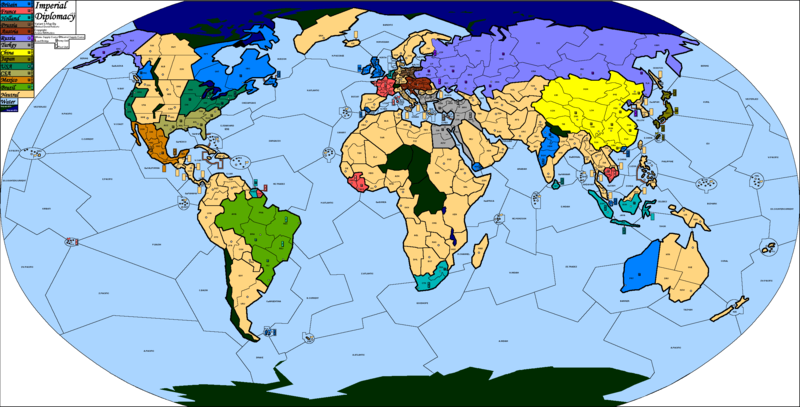 Though the provinces mentioned are separated by water, Both Armies and Fleets may move from one to the other. You will note that some sea zones can be found on both ends of the map. They are actually the same sea zones on both ends of the map. So in effect, a Fleet coming from Kuril Sea could move into the Westerlies on the right side of the map and be adjacent to the Hawaiian Islands on the left side of the map.